and light, medium and heavy-duty trucks including 2WD, 4x4 and Off Road Vehicles. See the quick reference table at the left for details of the products we offer. Use our handy "search" function at the top right corner of the page to find the part you need by description or part number. Also see our "Featured Parts" list below. 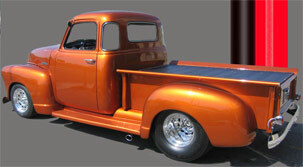 Need automotive parts, having problems with your car or truck? We offer the parts and information you need to get your vehicle back on the road. Download or copy our free troubleshooting, installation, and application guides from our big help section (see information left side bar). 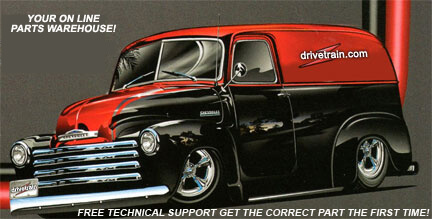 Visit our Blog, Facebook and Forum where you can find additional free technical help and post photos of your vehicle. Buy your products from us and get free telephone technical support (800) 216-1632 to help you with installation. High Performance and off-road driveshaft assemblies. Differential rear end (third member) parts including ring and pinion sets, rear-end bearing overhaul kits, spider gears, seven different types of positraction and locking differentials, and other components. Re-manufactured transfer cases, transfer case parts including viscous couplers, chains, shift forks, transfer case overhaul kits, including bearings, gaskets and seals. We sell new transfer cases when available. OEM replacement and high performance clutches, including matched sets for both gas clutch and heavy-duty diesel clutch applications, as well as flywheels for gas and diesel. New and remanufactured manual transmissions. Troubleshooting and overhaul manuals are available for automatic transmissions. Automatic transmission rebuilding kits, torque converters, shift kits and other individual hard parts. We are proud to announce that we can now offer GM, Ford, Dodge/Chrysler automatic transmissions - factory-built dyno-tested with 1-, 3-, and 5 -year warranties available, including heavy-duty utility towing units. Products to help you save money, improve performance, and extend your vehicle's life! To help save fuel, improve performance and extend vehicle life, we offer a number of products for your automobile, recreation vehicles, motor homes and pickup trucks. Overdrive units improve fuel economy by 20%. Performance enhancement power programmers are available for most late-model diesel and gas vehicles to improve performance by adding 2 to 4 more MPG in fuel mileage. Baseplates and towbars are available as well as braking systems to improve your vehicle's safety. To improve your vehicle's ride and safety, we offer active suspension and airlift systems for improved load handling. Extend maintenance intervals by installation of larger transmission pans and differential covers, additional cooling capacity extending transmission and differential life and saving you money. We also offer a series of diagnostic tools (technical notes) that can help you determine the cause of your vehicles mechanical problems. For further fuel savings, click on our link: save gas and diesel fuel, find out where to buy fuel. Drivetrain is a leading supplier of discounted parts and accessories for domestic and foreign cars as well as light, medium, and heavy-duty trucks. If you are having problems with your car or truck, you can rely on us to provide the parts and the information needed to get you back on the road. We are your one-stop store for automotive parts online and our warehouse is stocked with products to fix, improve, and enhance the quality of your vehicle. Our inventory consists of new, used, and remanufactured parts from the biggest brands in the industry – Chrysler, Dana, Ford, Active Suspension, Demco, PosiLoc, Spicer, Midwest Gear, Foot Axle, Air Locker ARB, Auburn Gear, Powertrax, Eaton Detroit Locker, Neapco, Gear Vendors, US Gear, RoadMaster, Eaton, Mag-Hytec, Afe, and Economic Positraction (Chevrolet GMC and Ford) – with all parts packaged and ready to ship WORLDWIDE. At Drivetrain.com, we live and breathe automobiles, striving to provide each of our customers with the best parts at the best prices. Whether you’re looking to make some performance changes to your car, or are in need of some safety enhancements for your truck, you can rest assured that we will have the part you need – any make, any model. We stock everything from high-performance driveshaft assemblies and OEM replacement clutches, to overdrive units and active suspension systems for improved efficiency and safety, all geared towards ensuring your vehicle reaches its potential. We supply the latest in diagnostic tools so that no mechanical problem stops you finding the part you need. Shopping for auto parts online is often a long and drawn-out process – not at Drivetrain.com. We are one of the few suppliers to actually publish prices, meaning no need to register for a quote and no need to wait around for a reply. Using our exclusive interactive catalogue and secure online checkout, you can purchase the part you need in minutes and have it shipped to your door immediately. Alternatively, you can find the right component with help from our trained technicians, by calling the order desk at 1-800-216-1632. When it comes to auto parts, your vehicle deserves the best – it deserves Drivetrain. From time to time we offer specials discounts for Internet customers. Click below to get advance notice of new products, special bonus offers and to be eligible for our free random gift drawings. We protect your e-mail address; we don't sell, trade or abuse them. If it's a part and or a component under your vehicle we can supply it!